“After graduating from the University of Denver with a B.F.A. in Art Education, I taught art in public school systems for six years. After studying with artists Joseph Bohler, Irving Shapiro, Lowell Ellsworth Smith, William Reese, and Scott Christensen I began painting full-time, putting my work in galleries throughout Wyoming and teaching a watercolor class at Central Wyoming College. I am currently painting landscapes and western subjects in oil and watercolor. I live in Dubois, Wyoming in the summertime and Wickenburg, Arizona during the winter. My work is basically traditional western realism. Jane’s exhibitions have included the American Academy of Equine Art, Women Artists of the West juried shows, the Desert Caballeros Western Museum’s Cowgirl Up!, and the Mountain Oyster Club Show, and I am an associate member of the American Academy of Women Artists. Past exhibits include the Western Spirit Art Show in Cheyenne, WY, the American Plains Artists show, the C.M. Russell Quick Draw and Auction in Great Falls, MT and the top 100 Art for the Parks show in Jackson Hole, Wyoming. She received a 2nd place award in the two-dimensional category at the 46th Annual WAOW Exhibition at the Hanna Gallery, Fredericksburg, Texas in 2016. She currently has two paintings juried into the 48th annual WAOW show in Bartlesville, OK through November 2018. 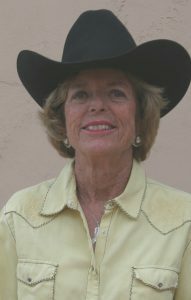 Having won many awards with her paintings throughout the years, Jane has been donating pet portraits and western paintings to high bidders at annual fundraisers for the Webb Center for the Performing Arts, the Wickenburg Community Hospital and the Desert Caballeros Western Museum in Wickenburg, Arizona. Permanent collections of Jane’s work are found in the Governor’s Mansion in Cheyenne, WY, Wells Fargo Bank and the Central Wyoming College Foundation in Riverton, WY, the Community Fine Arts Center, Rock Springs, WY, the Dubois Museum and the Headwaters Community and Conference Center in Dubois, WY, Bonneville Transloaders, Inc., Riverton, WY and many private collections throughout the United States and Europe.